Today's Activities:Fly from Guangzhou to Zhangjiajie (air fare and tax included, airport transfer in Guangzhou excluded). 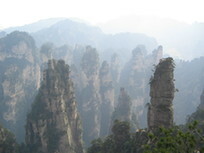 Meet your local guide at Zhangjiajie airport and transfer to hotel. Today's Activities:Today you will take a half day tour to the marvelous Huanglong (Yellow Dragon) Cave. Then transfer to airport for your departure. Fly back to Guangzhou (airfare and tax included, airport transfer in Guangzhou excluded).